It was about 3 :00 pm , My nephew , niece and my little girl rushed up stairs to my temporary studio ( my work desk : ) ) ..as soon as they were home from school ,, shouting ..come quick !! we found something ! 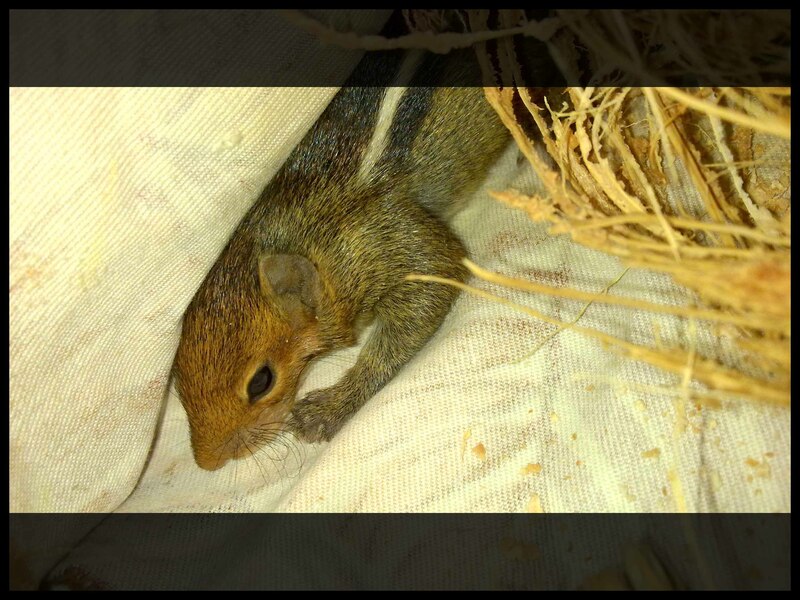 !..To my amazement i saw a small quitter ..a baby squirrel lying by the front porch ! !..it looked as if it was not able to move.. I picked it up and it seemed dazed and shocked , it didn’t even try to run !..we took it in and in no time all of us got out our old guinea pig’s den ready .. and placed the little one who was by now out of shock and scampering to hide among the coconut fiber and the piece of soft cotton clot we had placed . Now when i think about it .. I am sure it has its own story to tell .. I mean where did it come from ? How did it get to our front porch , why didn’t it run away .. so far it seems healthy .. no bruises or anything , each one of us had out assumptions , may be a crow picked it up from its nest and dropped it ? may be skelly our cat chased it to the front porch ? it seems a bit friendly , seems to me and this is my assumption that it was some ones pet and a crow must have picked it up from somewhere and dropped it own its way to god knows where ..and thats why it seemed totally dazed and in shock the it was not moving about . The little quitter seem fine now .. but we still have to wait.. its not taking any off at the moment , I tired many things from grapes , banana, nuts , almonds , even cooked rice !!! .. well I guess we will have to wait and see ..